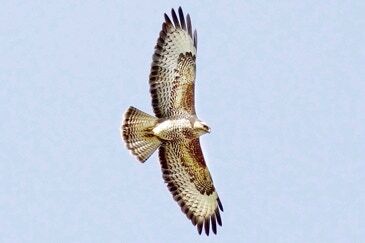 The common Buzzard is often seen soaring high above a field with the familiar v shaped wing. It is dark brown above and pale underneath.The tail is lightly barred. It calls with a loud drawn out mewing call. They feed on small mammals. Voles, rabbits, birds, reptiles, amphibians, insects and worms. They nest in trees and is made from twigs lined with moss and bracken. The male and female take turns in incubating the eggs. Due to myxomatosis among rabbits and unlawful persecution their numbers decreased. Some are still being poisoned now. Their numbers are on the increase.